We have often written on this blog about the distinction between a symptom (like numbness) and a root cause because it’s all too easy to focus on the former when we should always be trying to understand the latter. Take pain – for many people, the first instinct is to just reach for that pill bottle in the medicine cabinet and not think much about why they hurt. They shrug the pain off until it becomes a persistent problem that taking medications can no longer address. Numbness is another symptom commonly cited by our patients that is often easy to ignore until it becomes severe. When misalignments of your spine put tension on your spinal cord, its function, its ability to convey information, is affected. This can cause pain or tingling in other parts of the body, and numbness, too. Where might you feel numbness and why? Sciatica: The sciatic nerve is the largest and longest in the body. Many smaller nerves branch from it and run all the way from the pelvis to the feet. Sciatica is a condition that occurs when the sciatic nerve is inflamed, compressed, or irritated. This can manifest as pain throughout the leg, but also as numbness and chronic weakness in the lower extremities. The cause of sciatica can often by addressed by Chiropractic. Scoliosis: This is a deformity in which the spine becomes abnormally rotated and curved sideways. In severe cases, this can come to push the lungs and heart against the rib cage, with obvious negative health effects. There are several types of scoliosis. Degenerative scoliosis results from wear and tear on the discs of your spinal column and the facet joints where two vertebrae meet. Numbness and weakness in one or both legs are both common symptoms. This form of scoliosis can be the long-term consequence when spinal misalignments that could have been addressed by Chiropractic are left untreated. Spinal stenosis: This condition can develop as a result of scoliosis. 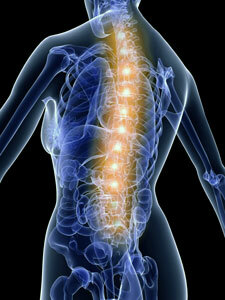 It’s common in people over 50 who are suffering from spinal degeneration. This is a narrowing of the spinal canal – those holes through the middle of your vertebrae through which your spinal cord passes. Think of doughnuts on a rope. Spinal stenosis causes the spinal cord and the nerve roots to become compressed. Among the symptoms is, you guessed it, numbness (or clumsiness) in the hands, along with weakness or incoordination of the arms and hands. If this condition occurs further down your back, lumbar stenosis, you may suffer weakness, numbness, or pain that radiates to the buttocks and legs. Thoracic Outlet Syndrome (TOS): With this condition, compression of the nerves, arteries, or veins behind the clavicle, or collar bone, causes distress that can result in pain and numbness of the arms and a feeling of tightness within the chest. TOS has a host of possible causes, from trauma, repetitive arm movements and rotator cuff injuries, to cervical disc disorders, fibromyalgia, or multiple sclerosis. Causes related to trauma and injury may be treatable with Chiropractic. Life: Numbness as a symptom of a problem with your spine doesn’t have to be related to a specific diagnosis like sciatica, scoliosis, spinal stenosis, or TOS. We treat patients all the time who suffer from misalignments of their spines without their condition fitting the profile of a specific condition like those above. But left untreated, their spinal issues may worsen to the point where they do. It’s our job to prevent that from happening. As we have written before, misalignments of your spine (what we call subluxations) can be caused by poor postural habits at the work desk or in front of the TV at home, by other lifestyle choices, car accidents, or sports injuries. These can all be addressed here in our Kanata Chiropractic clinic. And the sooner we take action, the greater the likelihood of a full recovery. Which comes back to what we always say – don’t ignore any persistent deviation from normal. It is not normal to suffer recurring pain, numbness, or any other form of discomfort or lost function, anywhere in the body. The odd issue that goes away after a few days is one thing, but one that keeps coming back should be taken as a red flag of a deeper problem. As always, early intervention is crucial. If you are experiencing persistent numbness in any part of your body, come see us.